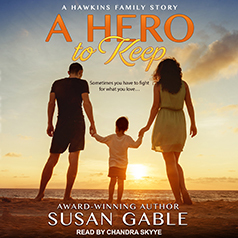 Susan Gable presents the first book in her Hawkins Family series. Contains mature themes. Sometimes you have to fight for what—for who—you love. But with custody of her traumatized six-year-old nephew on the line, she needs help. Charming Greg Hawkins, a comic book artist and art therapist insists he can coax Ryan into speaking again, enabling the boy to reveal what he saw the night of his mother's death at his father's hands. And though Shannon's skeptical of Greg's methods, there's no denying that he brings light and color to their lives. Greg, one of twelve siblings, knows anything worth having is worth fighting for. If anyone can prepare Shannon for the upcoming battle, it's Greg and his family.